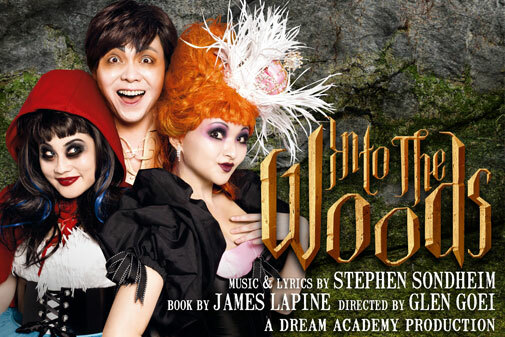 Into the Woods is a local production of Stephen Sondheim’s award winning broadway musical – a brew of bedtime fairytales with a slight twist. Brassy and brazen Little Red Riding Hood meets a dim-witted Jack from Jack & the Beanstalk meets a Cinderella who divorced her Prince Charming. Directed by Glen Goei, the musical claims to feature Singapore’s best and most stellar cast of actors: Selena Tan, Adrian Pang, Emma Yong, Sebastian Tan and Denise Tan. Indeed, the show which lasted three hours, was performed smoothly without a glitch. It starts off exciting the audience with its enchanting music, cosplay-goth-inspired stage costumes and a plot that unfolds as you expect it to in the original fairytales. It leads to intermission where the audience is almost misled to think it is where it ends because of a celebratory finale of small victories – the wolf has been killed, the baker breaks an evil spell and Cinderella weds a prince. However the show unexpectedly continues in a slightly dark and sinister quality where conflict of morals and relationships builds tension and suspense. As the musical continues in being unpredictable, some characters are even killed off. Of course as with all fairytales, there must be a conclusive “Happily Ever After”. And so it is too for the audience – an enthusiastic, shining cast who refreshes and lights up the stage with wit, humor, colour and melody and promises a delightful night out. This entry was posted in Fun and tagged into the woods, local, musical, review by lifestartsonfriday. Bookmark the permalink.